At Breeze Boat Lifts, we manufacture the finest boat lifts and Personal Watercraft/Jet Ski lifts available. 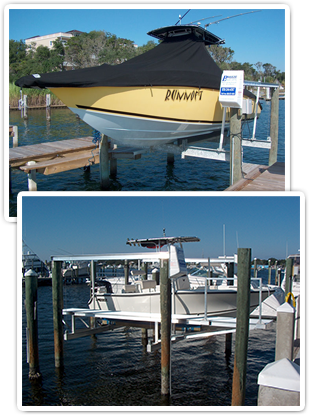 We have been fulfilling the special boat lift needs of our customers in the Panhandle of Florida for over 20 years. Over 80% of our customers are repeat buyers. Our superior designs and our experienced and talented staff set us apart from the competition. This is the reason that over 75% of the boat lifts in our own backyard are manufactured by Breeze Boat Lifts. Our backyard include owners in Destin, Sandestin, and Fort Walton Beach Florida, where water sports are a way of life. If you are in the market for a new boat lift, you need to insist that it is from Breeze Boat Lifts! As you consider your purchase, please keep in mind that your Boat Lift or Personal Watercraft Lift is our number one concern. Let Breeze Boat Lifts put 20 years of experience, knowledge, and quality designs to work for you. To fully appreciate the Breeze Boat Lift experience, please feel free to tour our web site. Better yet, just pick up the phone and talk to our friendly staff. We are always eager to discuss your needs. Contact Breeze Boat Lifts today!